Enjoy this 1800 acre all sports lake with a sandy bottom. The lake is quiet and has wonderful fishing, skiing, swimming. The bottom is all sand and very shallow for 200+ feet, making it great for kids! There is a small sea wall, no steps to the dock for ease. Lake entry from the dock is just 2 steps with railings on both sides of the steps. Activiites to choose from in the area include: Kayaking, canoeing, tubing, Sleeping Bear Dunes, Lake MI beaches, biking, Little River casino, and Crystal Mountain, golfing and fishing to name a few activities. WINTER offers SKIING AT CRYSTAL MOUNTAIN just 10 minutes away or enjoy snowmobiling the Spur Trails out your door. 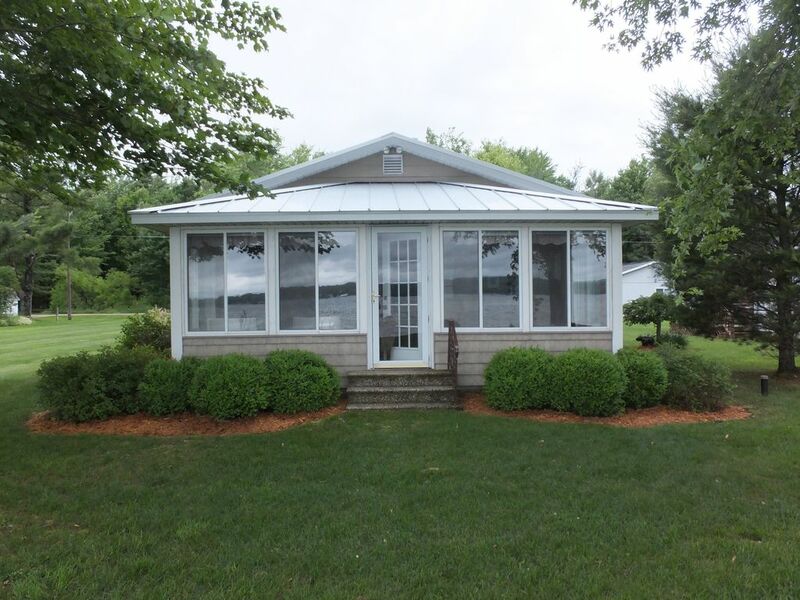 You will enjoy all the comforts of home in this 4 bedroom, 2 bath cottage! With the open floor plan and windows across the entire front of the cottage, the view is wonderful. The kitchen is open to both the dining and living areas with views of the water. It's set up to easily keep an eye on kids whether you are inside or out. This cottage is extremely clean and well kept with everything you will need to make your vacation enjoyable. Cottage is comfortable for 6 adults, or 6 adults + 2 children. The trundle beds are small twin beds, in small rooms. Master Bedroom - King size bed, private bath with a tub/shower combo. 2nd Bedroom - 1 Queen size bed 3rd Bedroom - 2 twin beds(Trundle style) 4th Bedroom - 2 twin beds(Trundle style) Second Full Bathroom has a shower. Other Conveniences to make the stay comfortable include: -Washer & Dryer -Fully equipped kitchen with dishwasher, microwave coffee maker, pots & pans, and all the utensils you need. -Outside there is a campfire ring, sandbox, and plenty of lawn chairs. -Bed linens and towels are supplied. -Sand anchor for a boat or personal watercraft. Very happy with accommodations and the property owner. My husband and I rented for one week in July. Very clean, updated cottage, cozy and comfortable. Neighbors very nice, we respected each other's privacy but also were able to exchange nice conversation. Aaron, the property owner was very helpful. No internet, but I was able to set up a hotspot so it all worked out. Loved the kayaks! We recommend this place if you're looking for a nice lakefront rental. We're happy to know you enjoyed your visit. Hopefully your vacation schedule will allow you to visit again in the future. This home exceeded our expectations for our family vacation. Everything was well appointed and exceptionally clean. The beds were very comfortable. The kitchen had everything we needed to make great meals quickly and easily. The dishwasher and washer/dryer helped us clean up and get back to the lake fast! The lake was very clean and quiet and it was like we had it all to ourselves. The owner was always available to answer questions. We hope to be able to use it again next year!! We had an amazing week at Bear Lake with our 5 children age 11 and under. The weather was in the 70's all week and the children spent everyday swimming and riding their bikes up and down the dead end road. The water was waist deep on my 3 year old and it stayed that depth for at least 100 feet. My older children loved taking out the canoe and my husband took the children fishing in the boat and my son caught a 19 inch bass! There is a really nice small beach on Lake Michigan just a short drive away off from 13 mile road. We loved driving there in the evenings to watch the sunset. Bear Lake is a great place for a family vacation and this cabin fit our needs exactly. The cabin is decorated so cute and is very clean and comfortable. My children are begging to do it again next year and we are definitely planning on it. You won't be disappointed at all in your stay here. It was more than my sisters and I could have asked for! The cottage was so inviting, the sunrises and sunsets were amazing. This IS the first time since we have started our sister getaways that we all agreed that this is THE PLACE WE'VE BEEN LOOKING FOR. We would love to go back next year. This is the 2nd time our family has stayed here. The home is wonderful and the veiw of the Lake is fantastic. I have been coming to Bear Lake for 50 years and since many of the old style resorts at Bear Lake have been replaced by condo's, treasures like this home are great. We hope to stay again in the future. Thanks, it is our RETREAT and we love sharing it with others. all available just out your front door. SKI CRYSTAL MOUNTAIN in the WINTER! Sleeping Bear Dunes and Leelenau are within 50 min. -Beulah, Onekema, Frankfort 20 minutes away. Mountain, Interlochen, and Bear Lake Highlands golf courses just minutes away. hayrides. Located on the East Side of the lake and just 5 minutes away. Crystal Mountain for skiing just 10 minutes away. -If you're feeling lucky the Little River Casino is 15 minutes. North for a another great day trip. Summer Rates: Under no circumstances are there to be more than 8 people at this rental unless it has been cleared with owner. 4th of July week and Bear Lake weeks are premium weeks renting at $2,000. Off Season Rates: Sept - May 3 day weekends are available during off season. Call for rates. TO RESERVE: You will be asked to send 1/2 of the rental fee to reserve your vacation dates. Then one month prior to the rental date you will send the other 1/2 of the rental along with your $500.00 security deposit. The security deposit is returned if there is no damage and cottage is clean within a week of check out.